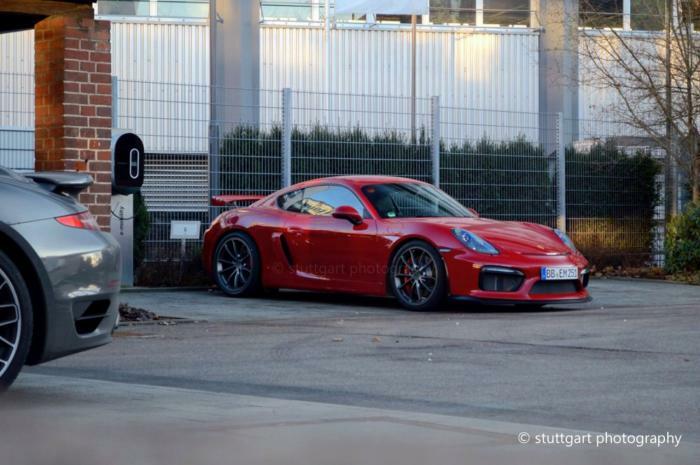 The new Porsche Cayman GT4 has been snapped on a parking lot in Germany. Seen here is a red example of the latest and most powerful version of the Cayman with a license plate from the city of Boblingen in the Baden-Wurttemberg state in Germany. The Cayman GT was revealed at the beginning of the month after several teasers and leaks. The machine is powered by a 3.8-liter flat-six motor, generating 385 HP (283 kW) that is connected to a six-speed manual transmission. This enables the car to sprint from 0 to 100 km/h (0-62 mph) in 4.4 seconds and hit a top speed of 295 km/h (183 mph). In Germany the model is priced from €85,779 (including VAT), while U.S. pricing starts at $84,600, excluding a $995 destination charge.